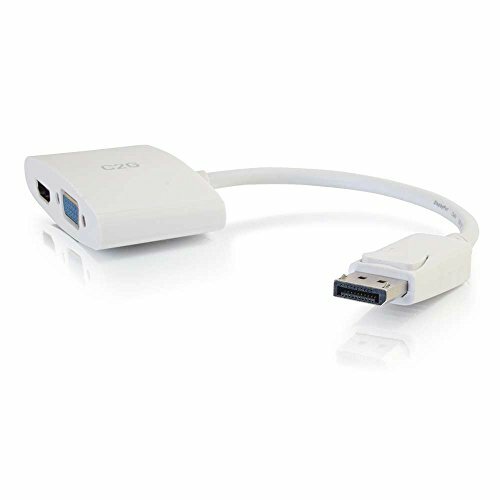 The 8 inch DisplayPort male to HDMI or VGA female adapter converter- White allows video signal to be sent from a tablet, laptop computer, or another source device with an outlet port to a projector, monitor, or HDTV with an HDMI or VGA input port. This product is an ideal solution for use in schools, conference rooms, or other work spaces that may utilize assorted displays with varying inputs. The versatility of This product encourages the use of both HDMI and VGA outputs. The compact design of This adapter is perfect to bring along with you when going to education or corporate environments. Increases user preparation for any meeting, presentation, or event and increases confidence knowing they have all of the right connections. This specific adapter converter supports up to 4K30 resolution for HDMI, up to 1920x1200 for VGA and also meets high performance application requirements. Does not require drivers for install and also does not require any additional power adapters.